It is never easy following Jesus, especially when he calls us to leave behind the comforts of home and go where he leads. A scribe who heard Jesus’ teaching answered the Lord’s call saying he would go anywhere. A bold comment for sure, so Jesus describes the cost in order to measure his commitment. Jesus’s mission meant that he and his disciples lived at the generosity of others. Commitment would be crucial if the scribe were to follow. A disciple who lacked commitment said he would follow Jesus, but only after he took care of personal affairs. His comments were met with words of rebuke from Jesus: “Follow me, and leave the dead to bury their own dead.” How do we respond to Jesus’ call? As Jesus sets out to the other side, there is room in the boat for all of his disciples. The Lord calls, but he doesn’t promise that it will be easy. He does, however, promise his presence and power. Ministry is seldom convenient; hard choices must be made. Sometime storms come from nowhere, but Jesus remains in command. 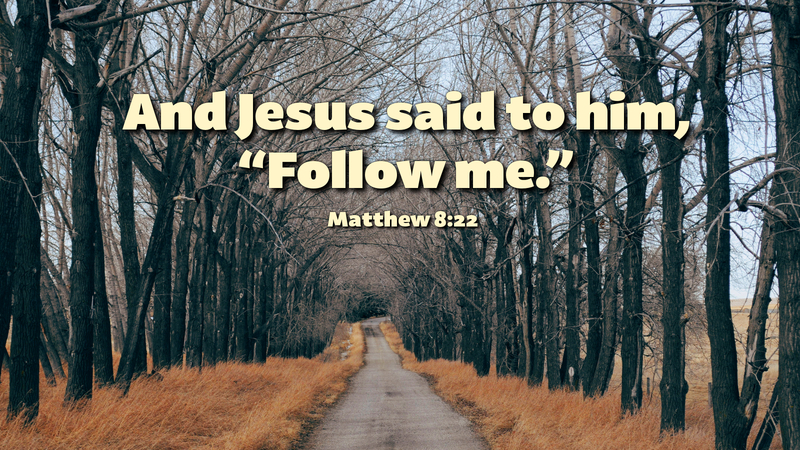 Jesus says, “Follow me.” Certainly the cost is high, but the reward is the kingdom of God. Prayer: Lord Jesus Christ, give me the will to follow you. Amen.